If you are wanting to go on a date night to a fancy restaurant, I recommend Umi. 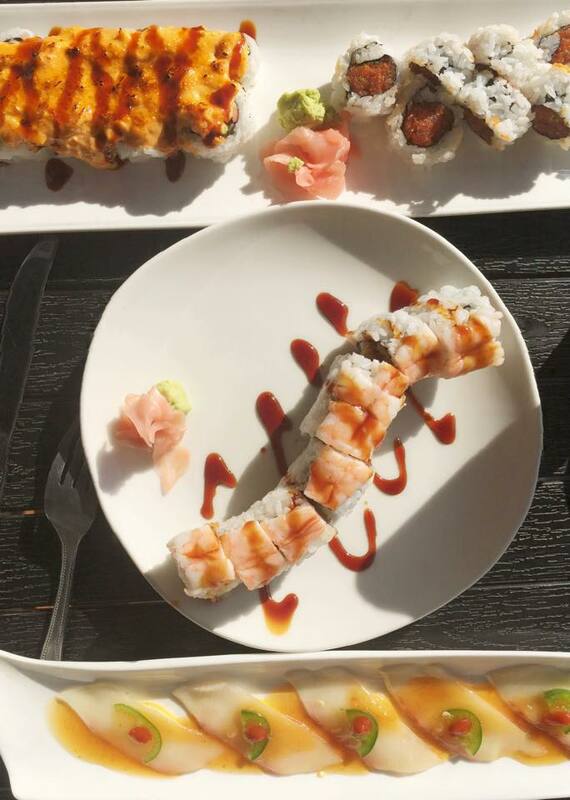 Umi has a ton of sushi to pick from, but for all you sushi haters, there is other options too! It is pretty expensive, but it has also been named one of the top places to go for sushi in Atlanta! Not to mention, the ambiance is beautiful and modern! My awesome friend’s parents actually own this restaurant and she gave me a gift card for my graduation present, and I about died and went to heaven!! I really couldn’t tell you my favorite thing on the menu because everything I got was so fantastic! But I will never forget their green tea ice cream- it is out of this world! I am probably going to end up requesting this as my birthday dinner destination! ^^^ This is the Tuna Carpaccio- Yum!! Zinburger is a burger restaurant, and I’m not kidding when I say that every time I crave a burger, I crave the Plain & Simple Burger; lettuce, tomato, mayo- That’s it! I always like to play it safe by getting a plain burger like this, but the flavors or the beef make it taste very unique! This is the type of place where it can be cheap, if you get an entrée and water, but if you want the whole experience pick out a milkshake! I have tried Creme Brûlée and it was awesome, but my go to is the Cookies & Creme. I also LOVE their sweet potato fries, but I didn’t really care for the truffle fries. 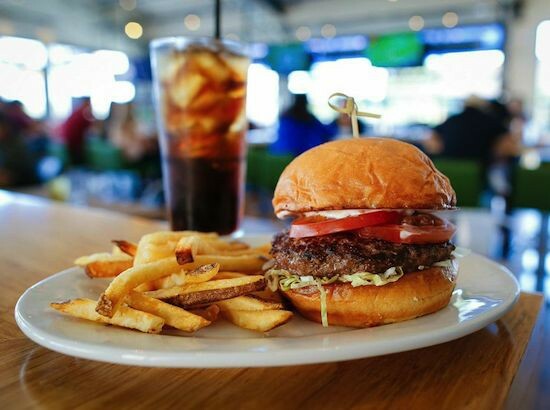 A little tip for the money savers out there, Zinburger has a happy hour Monday- Friday from 3pm-6pm where the Plain & Simple Burger is $5 instead of $9.25 and the fries are hard off!! Flying Biscuit is known for their fluffy white biscuits, but what is even better are their creamy grits! Every time I visit home, I never fail to grab breakfast here! In fact, last time I didn’t have time to eat their so my mom ordered me take out to take to the airport- how sweet! 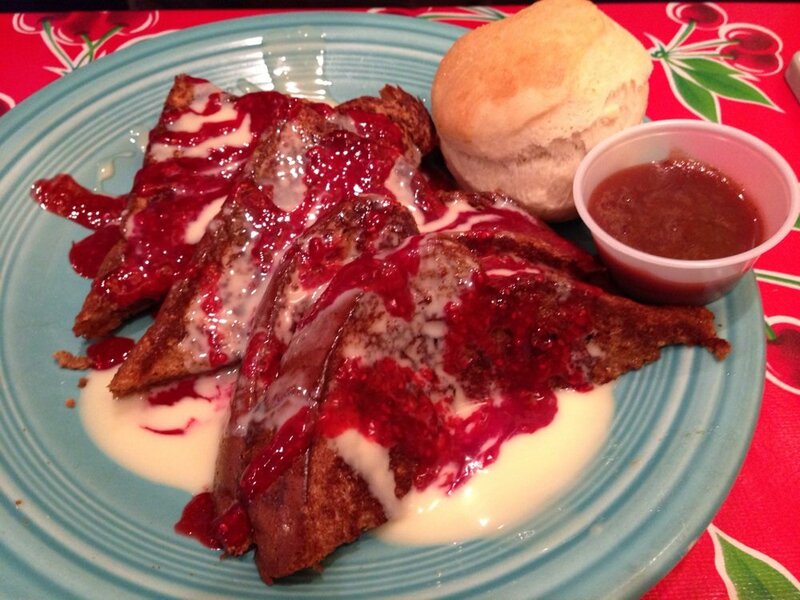 My mouth literally waters anytime I think about this restaurant because I die over their Heavenly French Toast! They drizzle raspberry sauce as well as honey cream glaze to make the perfect combination that will get you to order the full order instead of the half order! They have a location in Atlanta as well as Alpharetta that I know of. It’s not fancy or expensive so go in your morning sweats and enjoy some delicious breakfast! This has been my favorite sushi restaurant for years now! Zest is not as high-class as Umi, but it is located of Canton Street which is a fabulous place to get some late lunch/ early dinner and people watch. Going here for the first time triggered my love for sushi! I am head over heels for the Yellowtail Jalapeño! 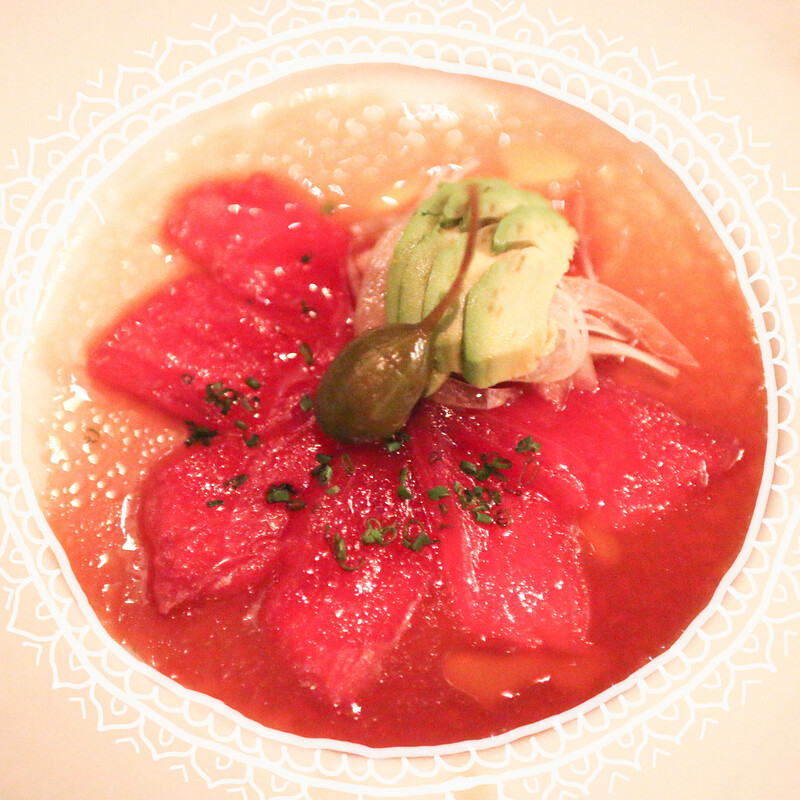 It is Yellowtail sashimi over a slice of lemon topped with a sweet sauce. It’s an addicting flavor and I always ask for extra sweet sauce! I also love the super crunchy roll which is masago and crunchy flakes mixed together topped with a piece or shrimp and a teriyaki glaze, this is one of the cheaper rolls but it is SO good! So if you’re feeling some Italian, I recommend Brio! I am all about going to fancy places and getting all dressed up, but I hate spending money on fancy food! Most of their pasta is very authentic, but I’m a simple gal so all I wanted was some chicken alfredo so I asked the waiter if I could get that because it wasn’t on the menu, and he said yes AND it was only $10!! I can never finish my pasta because I always fill up on bread, but for some reason this pasta tastes even better as left overs! 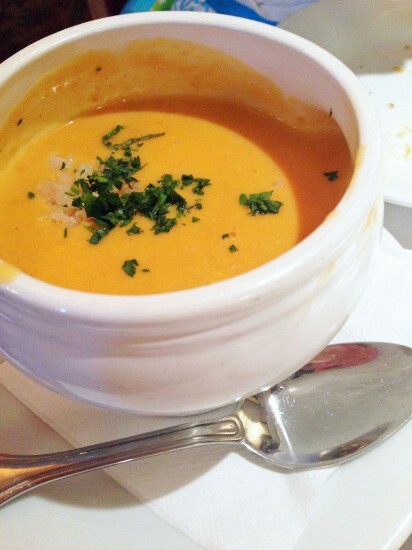 I also love their Lobster Bisque which is $6.95! As many of you know, I used to work at The Pie Hole, which is also located on the beautiful Canton Street! After being around the different kinds of delish pies for a year and a half, I am going though a little bit of a withdraw now that I am in college. One of my ABSOLUTE FAVORITES is the derby pie; is has chopped pecans and chocolate chips and it tastes like a Tollhouse pie! I have mastered eating this pie by microwaving it by no more or no less than 10 seconds! 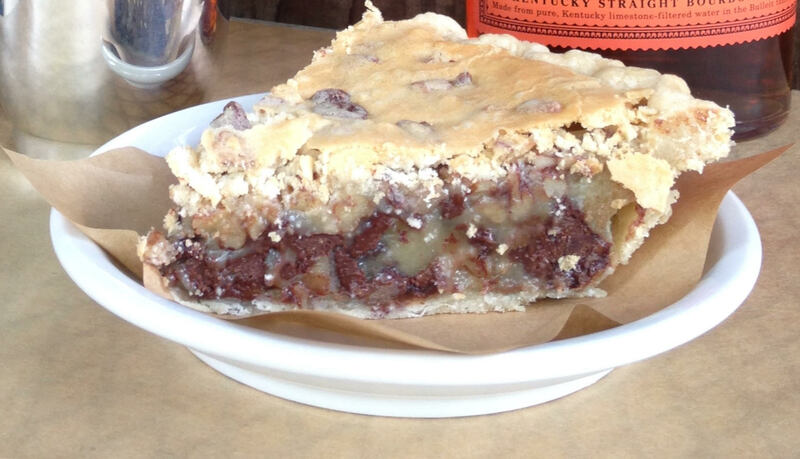 This makes this pie the perfect amount of gooeyness. I saved the most craved for last! Tokyo Boat is a Japanese hibachi restaurant where they cook in front of you! I won’t lie, the service is not all that great, BUT the food definitely makes up for it! For hibachi, this place is pretty cheap; I think it is about $16 not including drinks or tax or tip. All hibachi choices are the same price so I always get double meat of filet mignon. 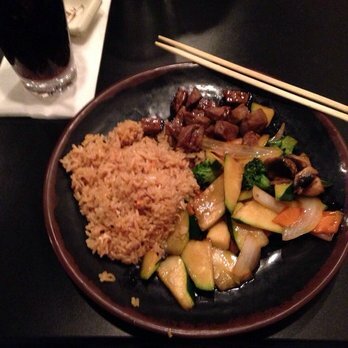 It comes with soup, salad, veggies, and the best part- fried rice! Tip: If you LOVE fried rice like I do, ask to get double fried rice and opt out of the soup and salad; it is an extra dollar, but it gives you some yummy leftovers! Every time I dine here I end up drenching my fried rice in Yum Yum sauce which results in weird stares from across the table. Next Post Cozy Things You Need In Your Life!